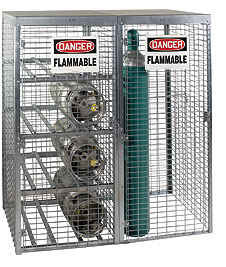 Saf-T-Stor Galvanized Cylinder Storage Cabinets provide efficient, compact tank storage. Galvanized rust-resistant finish stands up to harsh indoor and outdoor environments. Extra tough Saf-T-StorTM Cabinets provide an efficient storage solution for cylinder tanks while protecting them from damage and theft. galvanized steel sloping roof. Shelves 12-gauge galvanized steel c-channel designed to accept standard cylinders. and a "Danger Flammable Materials" sign and all necessary hardware. Exceeds OSHA 1910.110 requirements and NFP standard #58-79. Easy assembly. This item shipped Knocked Down (KD) to save on shipping cost.